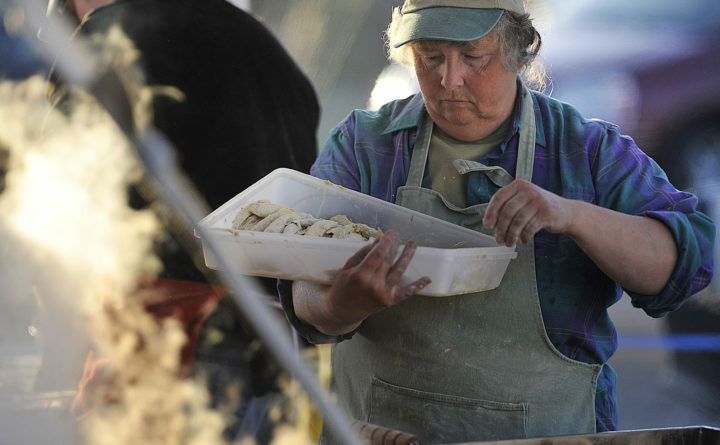 Muriel Gay of Jonesboro sets another tray of breaded smelt into the cooker at the Annual SmeltFry in Columbia Falls, April 16, 2010. This year's festival will be held April 13. A tiny town in Down East Maine will once again welcome hundreds of people this year to celebrate a little fish and the arrival of spring. Organizers of the Downeast Salmon Federation’s Annual Smelt Fry and Fisheries Celebration said this year’s event will take place in Columbia Falls on April 13. The festival includes activities and displays about fisheries and conservation, and it’s also a celebration of local food. The salmon federation said this year’s menu will include fried smelt, smoked mackerel, moose stew and local blueberries. The event takes place in the town of about 560 every spring.